Last week’s equity rally ran out of steam, and in the absence of important news, equity markets drifted. DAX was slightly down, other markets slightly up. 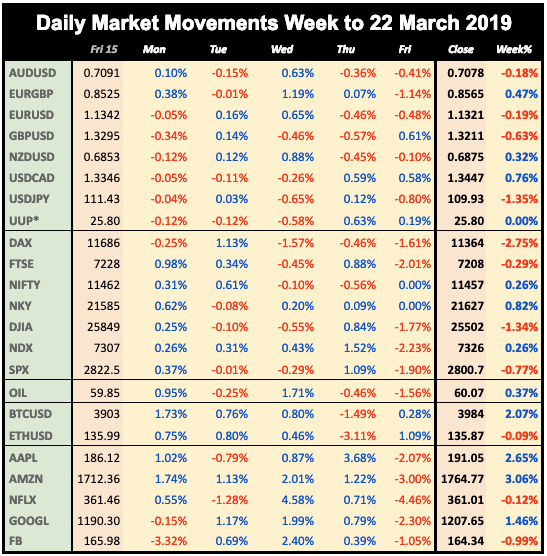 The dollar was firmly down (DXY -0.31%) after two weeks of gains, and all currencies (and Gold) were up with a particularly strong showing from CAD, tracking Oil, which was up nearly 2% on concerns about Libyan politics and conflict. It is pleasing to see the CAD/Oil link work so well, the loonie tracked black gold pretty much all this week, as seen in the chart below. Yields advanced slightly. A gloomy growth forecast from the IMF, and a Trump tweet threatening EU tariffs spooked markets, which pulled back today. 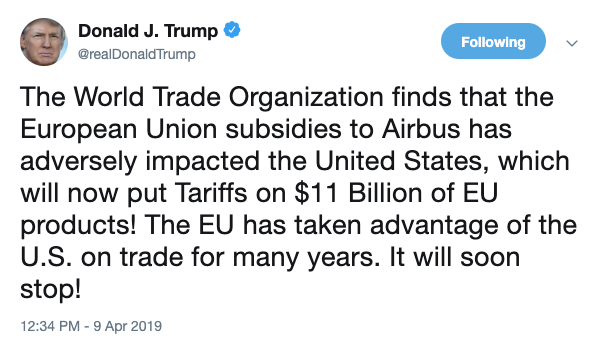 The DAX move was particularly sharp on the tweet, as you would expect as 20% of the German index is autos, one of Trump’s well-known targets. The dollar had a flat day, with a slight move up in JPY (and Gold) being matched fades in CAD (as Oil gave up some of Monday’s gains) and GBP (the usual reason). 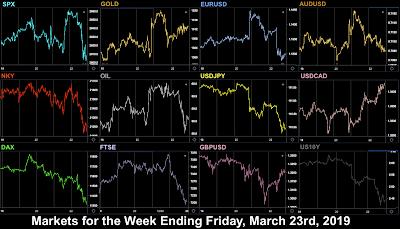 EUR and AUD were flat. 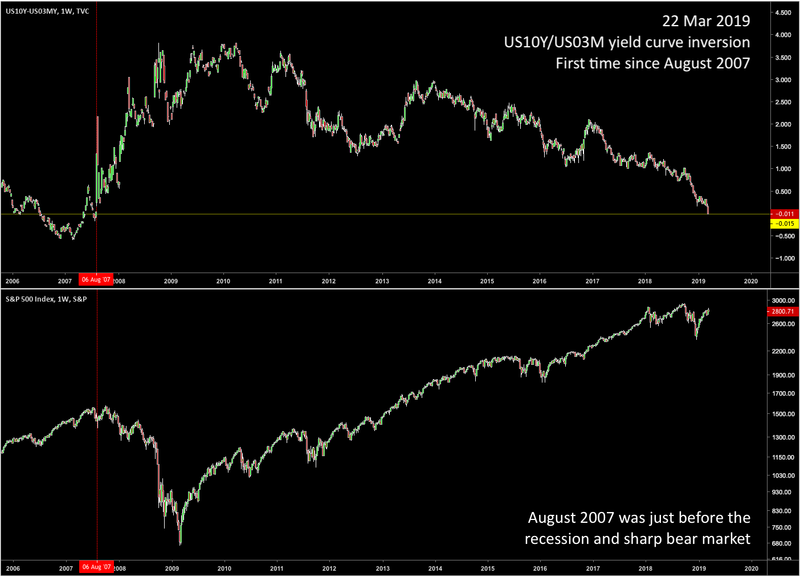 Yields were down due to stock-bond rotation. 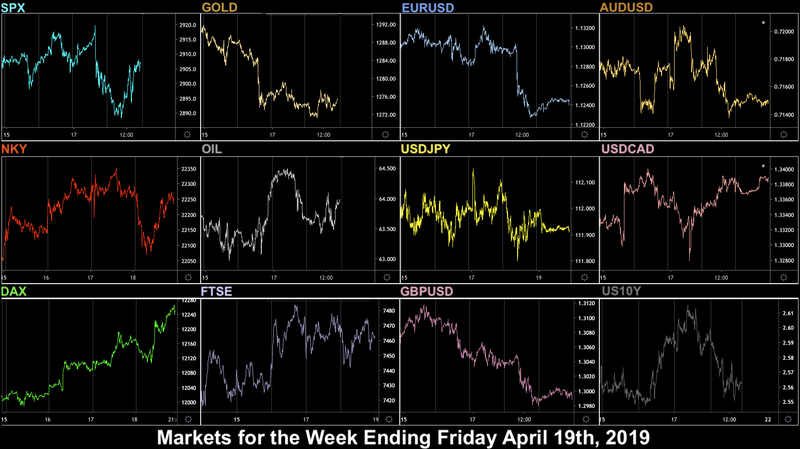 Today was packed with events, but they had little effect on the market. The ECB and Fed offered nothing new, merely repeating their dovish rhetoric from previous months, and the mixed US CPI at 1230 (MoM beat 0.4% vs 0.3%, Core miss, MoM 0.1% vs 0.2%, YoY 2.0% vs 2.1%) was disregarded. 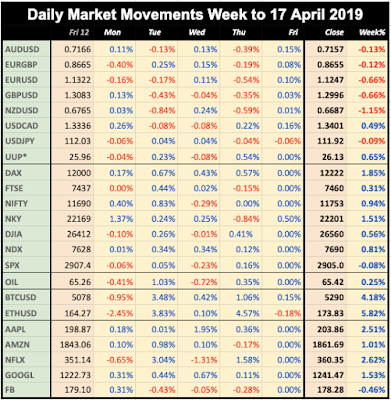 Even the hefty EIA miss (7.03M v 2.29M) at 1430 had little effect on Oil which followed equities up, recovering some (Europe/Japan) or all (US) of Tuesday’s losses. DXY slipped slightly (-0.11%) largely due to a GBP recovery after the GDP beat at 0830. EUR did crash 40 pips when ECB Draghi spoke at 1230, but this was recovered in four hours. Of course this may have been caused by the simultaneous CPI print (as CAD made a similar move, as did yields, which stayed down). 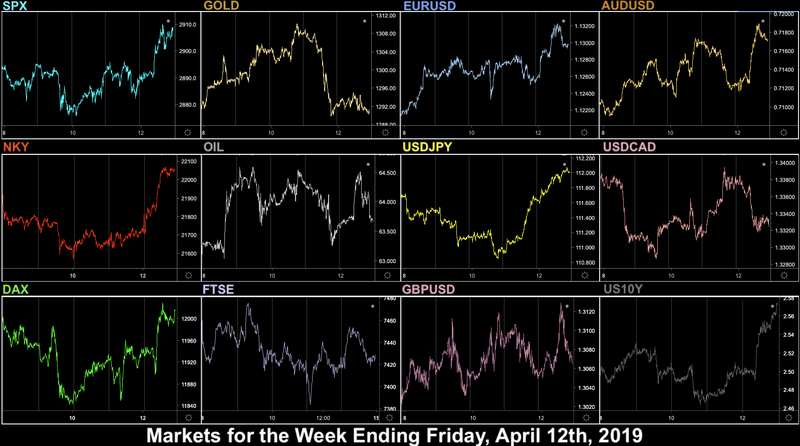 Despite the equity recovery, Gold and JPY continued to advance, as counterintuitively did AUD. The four-day pre-Easter week opens with little scheduled news, so attention will be on the next two banks, GS and C who report before the bell. GS is 5.26% of DJIA. Fed Evans (2019 voter, centrist) speaks at 1700, and BoE Haskel (centrist) is on an hour earlier. It is Tax Day in the US, so expect additional volatility. Markets are closed in Vietnam, Thailand and Sri Lanka. 12:00 NZD GDT Milk Index (time approx. Today is option expiration date for April and the week as tomorrow is a holiday. 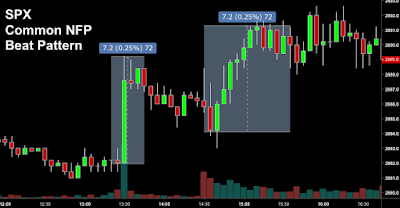 DJIA components TRV (before the market) and AXP (after) report today. 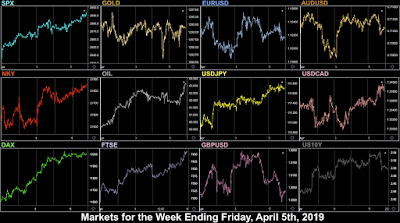 Markets are closed in the Nordic Countries (except Finland), The Philippines, and most of Latin America for Maundy Thursday. There is a rate decision on KRW. The first day of the week, the month and the quarter opened strongly after the China Manufacturing PMI beat at 0145. We pointed out the significance of this last week. The figure came in at 50.8 vs 49.9 est, only 0.9 beat, but critically crossing the 50 point, the line between contraction and expansion. The important US ISM similar release beat at 1400, giving a sharp uptick to USDJPY. (the same release for Germany at 0700 - 44.1 vs 44.7 est - showed that last month’s print of 47.6 was not an outlier, as some commentators had thought. The net result was a strong risk-on run for equities across the board, and an advance of 0.13% for DXY. EUR, JPY, Gold and 10-year Bonds (inverse to yields) dropped suddenly after the ISM print. Against this, CAD perked up after hawkish (well less dovish than expected) remarks from the BoC at 1755. AUD, without news, was flat. The dollar advance would have been greater expect for cable, up 1% on ‘soft’ Brexit hopes. As we predicted last week, the RBA did indeed join the chorus of doves at 0330, and the day started with a sharp fall in AUD. GBP had collapsed overnight, but climbed back to end the day flat on reports of bipartisan (ie May and opposition leader Corbyn) Brexit talks. CAD faded the Poloz gains. As AUD is not part of DXY, and the other majors had a quiet day, the DXY basket closed virtually flat (-0.03%), as did yields. Gold was slightly up. 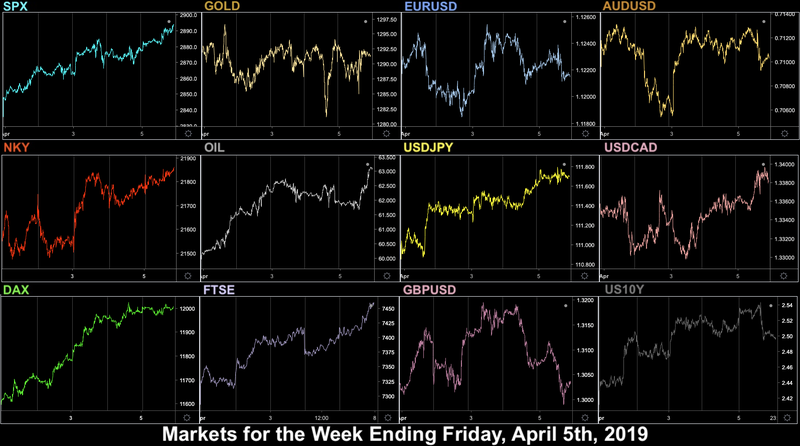 Equities had another good day, but mostly outside the US. NDX managed to add 0.3% but SPX was flat. What was interesting is that after months in the doldrums, BTC spiked up 20% up in an hour from 0430, with, obviously, over 100x normal volume (and held onto these gains). This was accompanied by a similar move in ETH, but that took two days to complete. Naturally rumours abounded an Asian ‘whale’ in this unregulated world. Reports in the FT that the US and China were close to finalising their trade deal, plus a raft of PMI Services beats, resulted in a third day of equity gains, particularly in DAX. Only the US wobbled slightly after their ISM Non-Manufacturing print missed at 1400, trimming an SPX 0.6% advance to 0.2% at the close. After two green days Oil was down slightly after the substantial EIA stock miss (+7.2M vs -0.4M, more is worse) at 1430. DXY shed 0.22% today, on the contrasting US and other PMIs, and possibly the ADP jobs miss at 1215. 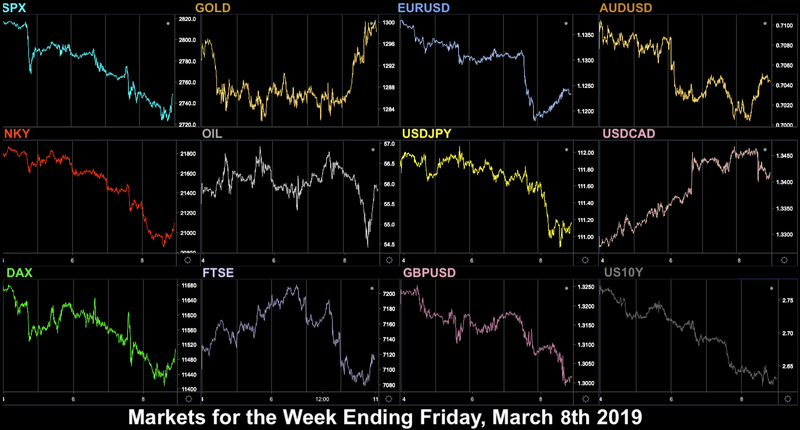 Gold was down, and yields and AUD were up in line with risk-on equities. 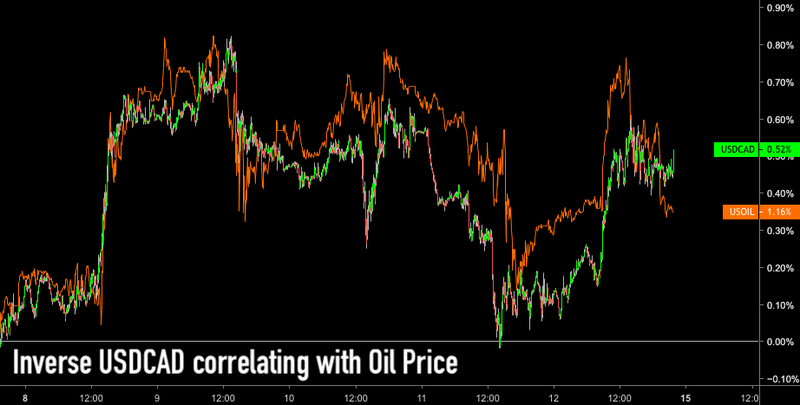 JPY and CAD were probably pulled in two directions, risk on vs dollar weakness and Oil respectively. Both currencies were flat. 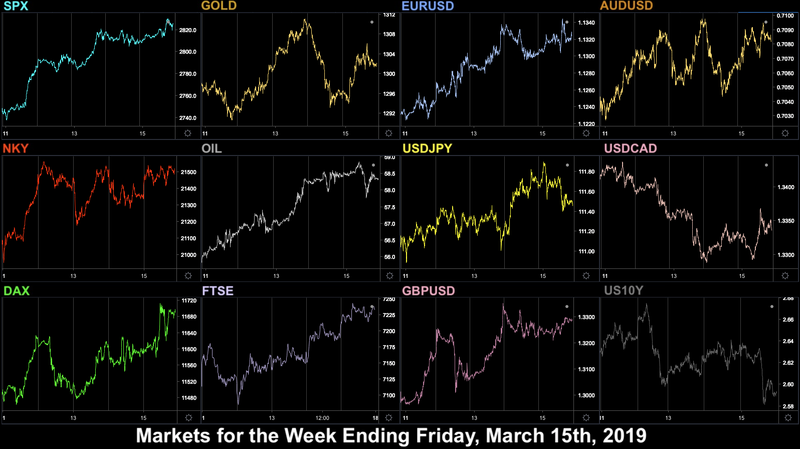 EUR and GBP were both up. Another up day from equities as Trump confirmed the China progress, although the pace was slowing. FTSE gapped down 0.4% to reflect overnight GBP strength but managed to recover this to end flat. 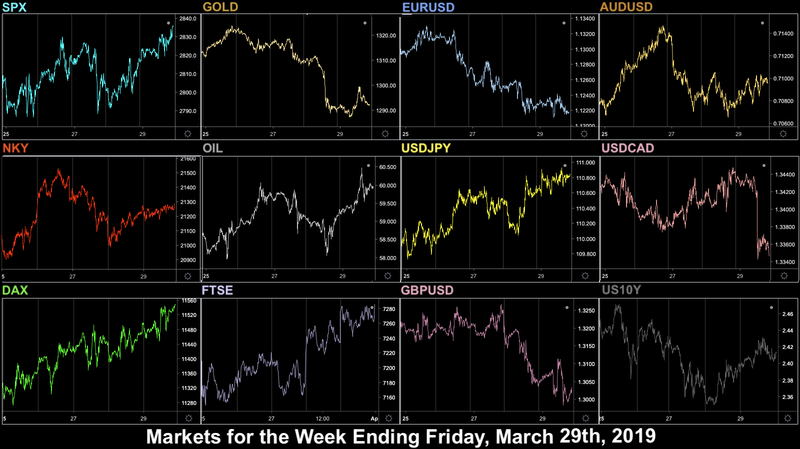 The dollar recovered to close where it ended on Tuesday, evenly across all currencies. Oil faded slightly in line with the dollar. 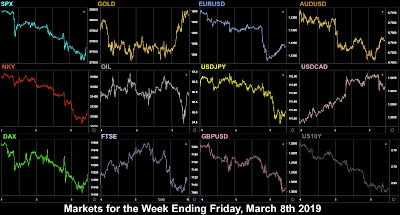 Gold was unusual, spiking down 0.5% through six hours to touch it Mar 7 low before recovering. Yields were flat on the day. Without a lead from China, which was closed, markets breathed a sigh of relief on the NFP beat at 1230, showing that last month was an outlier, and all were up, although the DAX gain was marginal. The SPX ran nicely to a pattern we have pointed out before, where after an instant spike, the price fades until the cash open, and then the size of that spike is repeated, as shown in the chart here. The trade is to buy SPX at the open, with a stop below the pre-NFP price, and a target of the ramp repeated. Oil was up 1.5% in line with the mood. DXY was only very slightly up (+0.07%), EUR made small gains to offset the fall in GBP (Brexit) and CAD (Canadian NFP miss). After a strong week, yields fell 4bp after Trump called for the Fed to reintroduce QE. The US major markets are now very close to previous all-time highs. SPX and DJIA are 1.68% away, NDX is even nearer at 1.39%, although notably RUT, DAX, NKY are around 10% off. It will be interesting to see if the SPX record close of 2930 is beaten next week. Another strong week for DAX makes it the top index mover again. In forex, the best trade would have been AUDJPY, up 0.90%. 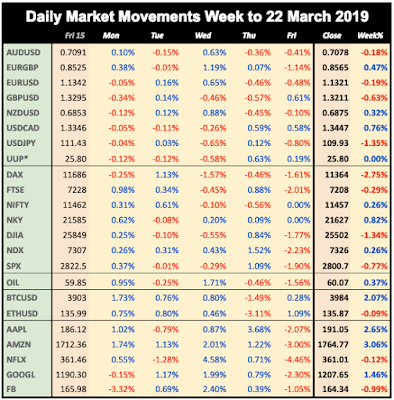 FANGs all beat their parent NDX index, with a particularly strong showing from FB, and the Tuesday crypto spike held, to give BTC and ETH their best week for over a year. After last weeks big calendar and start to the week and quarter, we are back to the usual quiet Monday today. Watch out for any weekend news, particularly on Brexit or Trump tweets. There are rate decisions on ILS and LKR. Markets are closed in Thailand. Another quiet day, with no releases in the European and US cash sessions, except the JOLTS jobs openings at 1400. Fed Vice Chair Clarida, (voter, obviously) centrist by definition, but thought to be leaning dovishly at the moment. Markets are closed in the Philippines and in Israel where there is an election, where the incumbent Likud government may not win. There is a rate decision on RSD. Easily the busiest day of the week, the EU summit is almost certain to grant UK PM May a long extension to Brexit, rather than the short one she has asked for, figuring that the longer the extension, the softer the eventual Brexit, which is the EU’s stated preference. With Bund yields still negative, the ECB statement should prove interesting. Further TLTRO details may be unveiled, and if not, may be asked about in the presser. US CPI is expected to be unchanged, which validates the Fed’s current no hike policy. The risk is to the upside, ie a beat may make traders think again. Although not a rate set meeting, the FOMC March minutes today put some flesh on the bones of the dovish reversal seem recently. Voting in the Indian election starts today. The world’s largest electorate will take six weeks to vote, with the counting starting on May 23. Exit polls are notoriously unreliable, but nevertheless, any significant move from the BJP to the Congress party may have an effect on markets. Chinese and German inflation are the key prints on the day. The Q1/2019 Earnings Season starts today with the usual first reporter JPM, and fellow bank WFC, before the bell. The dovish Fed is bad for banks, and traders will be watching forward estimates closely. The IMF begin a three-day meeting in Washington DC. Today is the next Brexit 'deadline' although it is likely another extension will have been granted before then. Markets have a half-day in Sri Lanka. There are elections in Finland on Sunday. gave up Wednesday’s gains in line with the equity fade. The third and final Brexit deal vote is planned for today, although weekend reports suggested it may be cancelled due to lack of support. The Boao Forum opens in China today, with Premier Li Keqiang giving the opening remarks. Fed Harker (dove, 2020 voter) speaks at 1200 followed by Rosengren (hawk, 2019 voter). There are rate decisions on HUF (est 0.9% hold) and NGN. Today is the most important day in the week for data, with the final US GDP print for Q4, as well as PCE, the Fed’s preferred inflation indicator, and German inflation as well. Fed Quarles (centrist, 2019/2020 voter) speaks at 1115, followed by Williams (hawkish, 2019/2020 voter) at 1325 and Vice-Chair Clarida (centrist 2019/2020 voter) at 1330, and Bullard (dove, 2019 voter) at 2120. SNB Maechler is on at 1700. There are rate decisions, all expected to hold on CZK (1.75%), ZAR (6.75%) and MXN (8.25%). In the British Parliament, today is the last day to pass the Brexit extension bill (short or long) as the House does not sit this Friday. Equities sharply reversed last week’s decline today as the mood changed, driven by M&A enthusiasm as NVDA announced the acquisition of MLNX, and the merger of DB and CBK.DE moved closed. All four stocks shot up. SPX added 1.5% and NDX was up 2%. DJIA opened much lower as its largest component BA gapped down 10% after the 737-Max disaster in Ethiopia, but recovered during the day to close 1.2% up. DAX and NKY followed the US, but FTSE was in the red due to the strong pound. As explained many times in the past, the FTSE has an large number of companies whose revenue is in USD, and so their GBP-quoted stock price moves up when GBP moves down. Despite encouraging remarks from President Trump at the weekend, and another call for a weaker dollar, a rally in China during the Asian session did not prevent optimism from fading in the US markets and SPX close down 0.4%. DAX and NKY followed suit although FTSE advanced as GBP faded some its Brexit hopes gains. Yields fells on stock-bond rotation. President Trump also called for a weaker dollar again, but this had no effect, with all currencies except JPY declining slightly, in line with the equity softening. 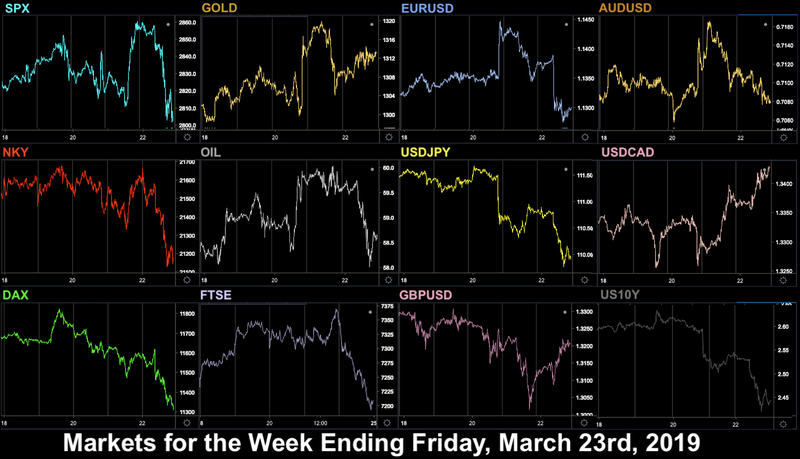 Gold fell in line, although Oil managed to move up after Friday’s sharp fall. Mixed US data left equities directionless today. The situation was better in Europe after UK, German and Eurozone PMI beats at 0855, and DAX and FTSE were both up slightly. 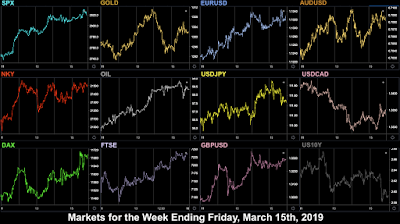 The dollar benefited from continuing EUR weakness ahead of the ECB meeting, with DXY advancing 0.24%, and CAD and JPY also fell slightly, and GBP was flat, as was Gold. 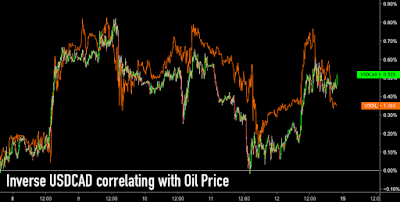 Oil was choppy but ended slightly up, whereas yields fell for a second day. AUD hardly moved after the rate hold. Markets faltered again today on the US trade balance miss at 1330, the worst deficit since 2008, together with the ADP miss at the same time, and all indices were down, even FTSE. Yields were down 3.2bp, and JPY was up in line with the risk off mood. DXY was flat (as was Gold), with small recoveries (after two days decline) in EUR and GBP balancing a sharp drop in CAD (only 9.1% of the basket) after gloomy growth forecasts from the BoC at 1500 and mixed Ivey PMIs at the same time. AUD dropped sharply by nearly 1% on the Australian Q4 GDP miss. Oil ended slightly up, with the usual choppiness around the EIA print at 1530. The headline missed, but the Gasoline estimate beat. Another day, another problem. Following the record US trade deficit and the BoC forecast, today the ECB downgraded growth forecasts for the giant Eurozone, and more significantly reversed policy from tightening (the end of bond buying in December) back to easing by a new TLTRO program. The forecast was expected, the TLTROs were not, and EUR fell 1.27% during the next six hours. US, Japanese (futures), and UK equities accelerated their fall. DAX had a short currency related spike up and then joined them. DXY had its best day since June 2018, and rose 0.75%. As you would expect EURJPY moved even more (down 1.18%). 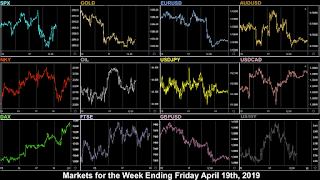 Other currencies moved down, although notably, CAD did not suffer from its usual risk aversion, having softened the day before. Gold was flat. Oil was up slightly again, staying in the 56.50-57.50 range it has held all week. 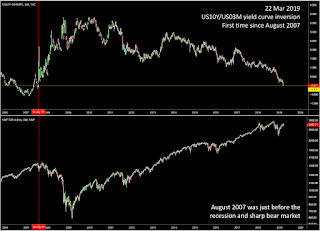 Yield were down again, following the rotation principle rather than the stronger dollar. This is showing that the dollar was not really stronger, it is just EUR that is weaker, as evidenced by the move down in USDJPY. The February NFP miss (20k vs 180k) at 1330 gave us three bad days in a row. Small misses sometime push equities up on the theory that they will delay rate hikes, but this was the third-worst print since 2011, following a stellar (311k) January. No tweet from Trump today! 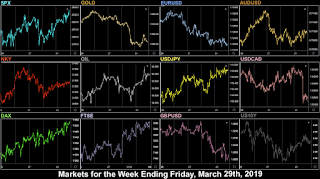 Markets all slid down further, although there was a small rally in the last hour. Notably China fell 4% in Asia well before the NFP release. DXY was down 0.26%, giving back a third of its Thursday gains, with all currencies up, in particular big moves up in JPY and Gold, and down in Oil in line with the equity fade, although the latter recovered somewhat into the close. The Canadian NFP beat had a surprisingly modest effect, with USDCAD only down 0.28%, no more than DXY as a whole. Yields were down 5bp on rotation or dollar tracking. 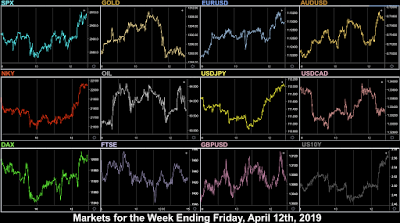 Despite the stronger yen, NKY was the biggest index decline this week. The strong yen also made shorting GBPJPY (down 2.35%) the best forex trade of the week. Cryptos went to sleep again after a brief burst of activity last week. Another mixed week for FANGs with a surprisingly strong performance from FB. Today is the first day of the bi-annual one-hour disconnect between the start of daylight saving (summer) time in North America and Europe. The first effect is the Retail Sales print, an hour earlier for European traders, coming after the worst figure since 2001 last month. Our times remain on GMT, as they will when Europe enters DST. Today, we have another attempt by embattled UK PM Theresa May to get her Brexit deal through the British Parliament. The vote seems likely to fail again, at which point the saga moves to later votes in the week. US inflation (one leg of the Fed’s dual mandate) will inevitiably affect USD if it is well off estimates. Fed Chair Powell is due to speak at some time today (unconfirmed). Provided the Tuesday vote fails (as expected), a (free) vote by UK MPs is expected to on whether it is acceptable to exit on Mar 29 without a deal. This is designed to be rejected, and almost certainly will be. In the middle of this, the UK Spring Statement (Budget) is announced, with possible tax changes. A new US report, the unwieldy-titled Nondefense Capital Goods Orders ex Aircraft has been marked by commentators as important, more so that the normal Durable Goods release at the same time. After growth downgrades elsewhere last week, traders will be listening carefully for any similar views from the BoJ, so for once, this normally unimportant rate decision and statement may cause some JPY volatility. The Michigan Sentiment Index is estimated to fall further. The miss two weeks ago caused a sharp fall in SPX, and another could do the same.